inSharAlthough Thomas Gainsborough English, 1727–1788) is widely recognized as one of the most fashionable portrait painters of the eighteenth century, a new installation at the Clark Art Institute provides an opportunity to study the artist’s landscape drawings, working methods and imaginative approach to representing nature. Thomas Gainsborough: Drawings at the Clark, on view from December 1, 2018 – March 17, 2019, marks the first time that the Clark’s entire collection of rarely exhibited Gainsborough drawings will be shown together. The installation includes a suite of fourteen sheets from the Manton Collection of British Art, along with two works acquired by Sterling and Francine Clark. Gainsborough’s scenes of the English countryside are presented in conjunction with Turner and Constable: The Inhabited Landscape, opening on December 15, 2018. That exhibition explores the wide-ranging landscapes and seascapes of John Mallord William Turner (English, 1775–1851) and John Constable (English, 1776–1837), who built upon the landscape tradition that began to gain recognition through Gainsborough’s work. The Manton Collection of British Art is considered one of the greatest collections of British art assembled in the last fifty years. In 2007, the Manton Foundation donated more than 250 works to the Clark, constituting the most significant addition to its collection in the Institute’s history. Abounding with foliage, cottages, and pastoral figures—shepherds driving flocks of sheep and cows drinking from pools or streams along meandering paths—Gainsborough’s landscapes present an idealized view of country life. Rather than depicting specific locales, his drawings evoke the gentle woodland and heath of his native Suffolk in the east, and, later, the mountainous Lake District of Cumbria in the northwest. Early in his career, Gainsborough sometimes consulted detailed drawings of flora, such as Study of Mallows (mid- to late 1750s), when completing the foreground foliage of his paintings. 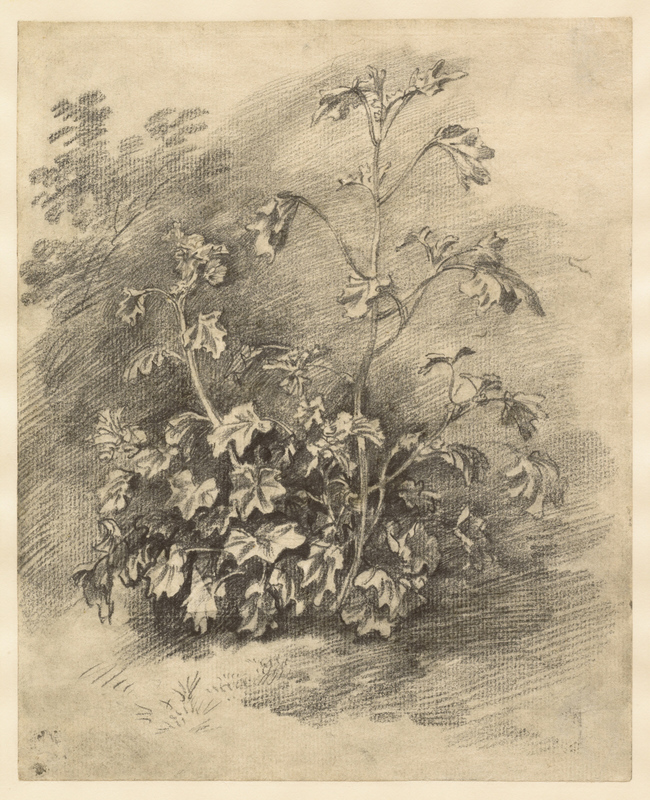 Gainsborough added depth to the clump of mallow by blending his soft graphite strokes with a stump, a tool made of tightly rolled paper or felt. This drawing likely came from one of the artist’s sketchbooks, which were dismantled for sale after his death. Study of Mallows. 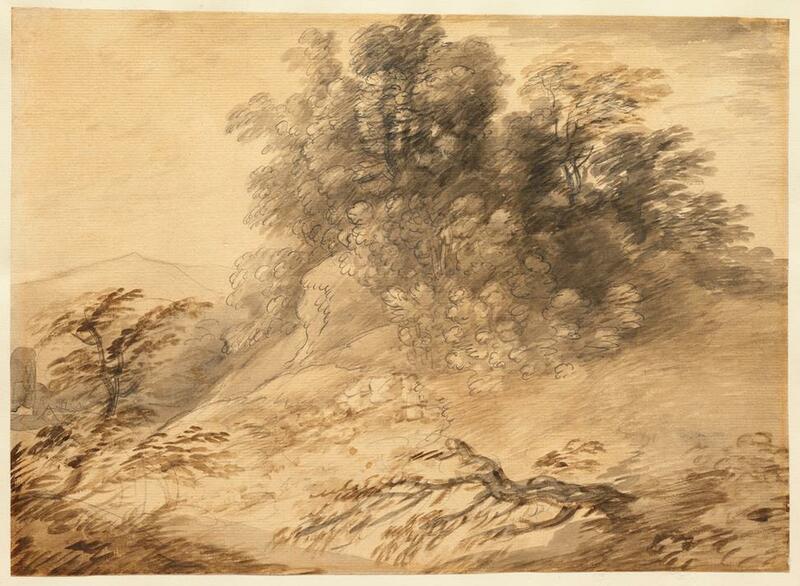 The withered trees in the foreground are drawn with calligraphic strokes of watercolor. Scalloped graphite lines define the leafy contours of the group of trees at center, strengthening the sketchy mass of light and shadow formed by layered sweeps of wash. In the early 1770s, Gainsborough introduced materials traditionally associated with oil painting into his drawings. After establishing this composition with watercolor and thickly applied opaque pigments, he stabilized the sheet with a coating of water mixed with gum arabic, a hardened sap derived from the acacia tree. Once dry, he coated the drawing with three layers of mastic gum dissolved in turpentine, a common solvent for oil paints and varnishes. 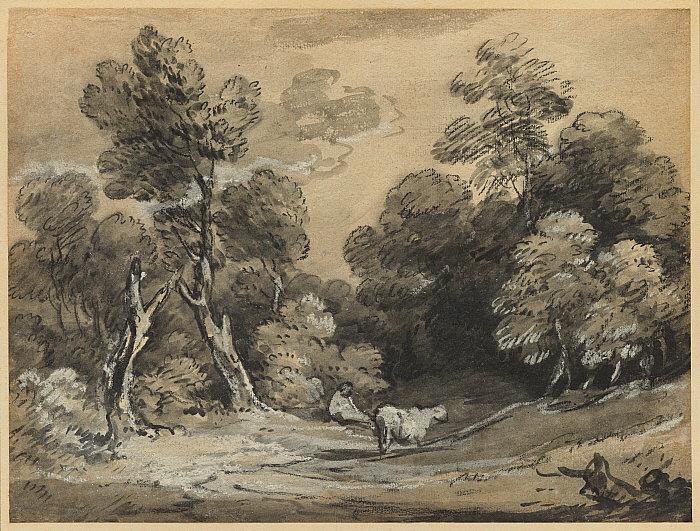 Wooded Landscape with Herdsman and Cow (early 1780s) epitomizes the artist’s inventive mixed media technique. A sense of rapid handling pervades the composition—a few lines and smudges of chalk define the figures while short, multidirectional strokes describe surrounding foliage. However, the layered use of wash, chalks, and fixative reveals a methodical approach. Gainsborough applied gray ink washes to form a tonal foundation for shadows, which he drew in black ink and chalk; the latter medium was then dragged and smoothed to the desired effect. Throughout the composition, he scattered broken lines of white chalk that serve as highlights in combination with areas of untouched paper, further indications of the artist’s forethought. During the summer of 1783 Gainsborough visited the Lake District of northwest England. The shimmering lakes, valleys, and high peaks of the region attracted artists and tourists in pursuit of its scenic views. 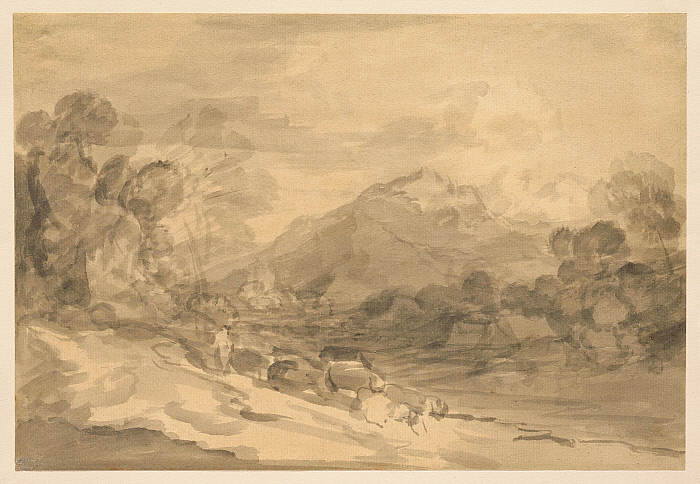 Rocky Wooded Landscape with Herdsman Driving Cattle along a Valley and Distant Mountains (c. 1783), composed entirely of freely brushed, transparent layers of ink wash, is reminiscent of the picturesque vistas he encountered there. During this period, artists favored wash when carefully recording features of a recognizable landscape. Gainsborough, however, used the medium for painterly expression to represent an unidentifiable mountain that was likely made from memory.